Going into the TAR 23 season finale, four strong teams are competing for the one million dollar prize. Which team has the best chances of winning, based on prior performance? Through the race, all of these teams have raced against one another, so we have a “head to head” view of how they do, relative to one another. 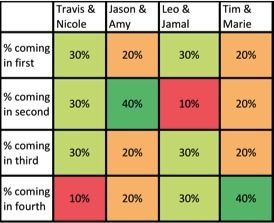 Using this view, while Travis and Nicole and Leo and Jamal have finished in first the same number of times, Leo and Jamal’s other performances have skewed toward the bottom. These lower place finishes by the Afghanimals also included two U-Turns. The Exes, Tim and Marie, finished first in the opening leg, earning them an Express Pass, so their second victory was assured by the first victory. Their most frequent finish has been the lowest, making them the most vulnerable. Although, since Marie is always right – or at least 99% of the time – you’d think that this would give them a distinct advantage over everyone else, no matter who is racing. So the team that may be lurking as the best is Jason and Amy. They came in second place five times during the race, and recently had their first first place finish. They never had an Express Pass, and in one leg, they even tried to get the Fast Forward, and were denied the opportunity to complete it, due to weather conditions, and this dropped them to the lower tier that leg. Over the last three legs, they have fared the best, with an average finish of 2.0. Compare that to Travis and Nicole’s 2.7. Heck, Amy even saved Nicole, who has struggled in a few of the challenges, two legs ago. So could this dating couple be the team to beat? Over the course of the full race, Travis and Nicole have been the top performers, but recent legs have shown that the other teams are just as strong, making this an exciting finale without a clear front-runner. Unless, of course, we take into consideration that Marie knows everything, and is right 99% of the time. Then for sure she will win. Oh, and her partner would win, too, if she wins. He just has to agree with everything she says and does. Tags: Jason and Amy, Leo and Jamal, The Amazing Race 23, Tim and Marie, Travis and Nicole, Who will win?